Saying goodbye to a loved one is one of the most difficult parts of a person’s life. When someone receives a terminal diagnosis, they may be reluctant to share the news with the people who are important to them for fear of changing how they are looked at and affecting whatever time they have left to spend together, though that does not necessarily help the hurt those left behind will eventually feel. Hiding someone’s own medical prognosis from them is far less common, but it too presents ethical and emotional issues since the closure desperately needed by those who remain after someone dies will be impossible to achieve. Billi (Awkwafina) feels a very strong connection to Nai Nai, her grandmother (Shuzhen Zhou), calling her regularly from New York to say hello. When she finds out that her parents (Tzi Ma and Diana Lin) are traveling to China under the guise of celebrating her cousin’s wedding, Billi insists on tagging along so that she can participate in the true purpose of the trip, to spend time with Nai Nai before the cancer she has been diagnosed with worsens and kills her. Billi struggles to maintain the agreement her family has come to: not to tell Nai Nai about her condition. Awkwafina is a very talented and funny actress who had a truly memorable supporting role in last year’s “Crazy Rich Asians.” Following that film breakout up with this lead role is a truly terrific choice, especially since it once again surrounds her with an all-Asian cast. While this might seem like a repeat trip to an Asian country, this film is extremely different from the romantic comedy megahit, telling a dramatic story through a distinctly humorous lens. 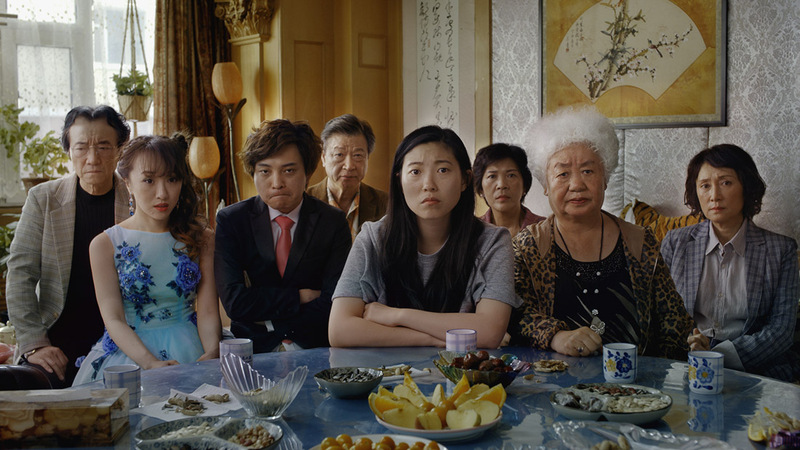 Much of the film is subtitled, though Billi expresses that her Chinese really isn’t great, and her cousin’s bride doesn’t even speak any of the language. This is a sweet and endearing film, based, as declared by the opening titles, “on a true lie,” and one that grapples with conflicting notions over what control someone should have over their own life, especially at the end. The dynamics of Chinese culture, including a heartwarming visit to the grave of Nai Nai’s late husband where family members offer him cigarettes and other mementos of his life, are compellingly explored, with Billi fighting back less against her heritage and more against the questionable ethics of hiding a person’s medical diagnosis from them. This is a winning film that succeeds both comedically and dramatically, a sure sign that Awkwafina has a bright and exciting future ahead of her.